Writing a book is best done one chapter at a time. If you try to tackle too much at once you'll just end up overwhelmed and incapable of even finishing a single chapter. This has been a big challenge, but the biggest writing challenge for me has always been finding out how to explain things in a simple manner while still getting the complete point across. "You never really know something until you have to teach it to someone." This isn't an exact quote, just something I've remembered roughly ever since I was a kid. And it couldn't be truer. You might think you know something, or are good at something, but until you have to explain it/teach it to someone else you realize your knowledge was only fuzzy. Writing forces you to sharpen your focus on the subject at hand. It has the ability to help you develop an incredibly clear level of understanding. And for this reason, writing is best used to convey some truth which has the ability to teach either yourself or another something valuable. For discovering that in my own life I'm grateful, but it's because of this that I also feel the need to tell others about the power of writing. If you're faced with a difficult situation, or sense some strong or confusing emotions rising to the surface, take out a pen and paper or sit down at your computer and just write. Write whatever comes to mind. "It kind of feels like anger. ", or, "I think I'm jealous of my sister." Whatever rises to the surface when you begin to write, just let it out. This can be an incredibly healing activity and a great partner to mindfulness. I hope you enjoy this exclusive preview of Part 1, Chapter 2 of The Little Book of Mindfulness: Finding Peace Within. Let me know what you think! So, now you have a general understanding of what mindfulness is. But why practice mindfulness? What’s so important about being mindful? Knowing how mindfulness works is only part of what constitutes a complete understanding of mindfulness. 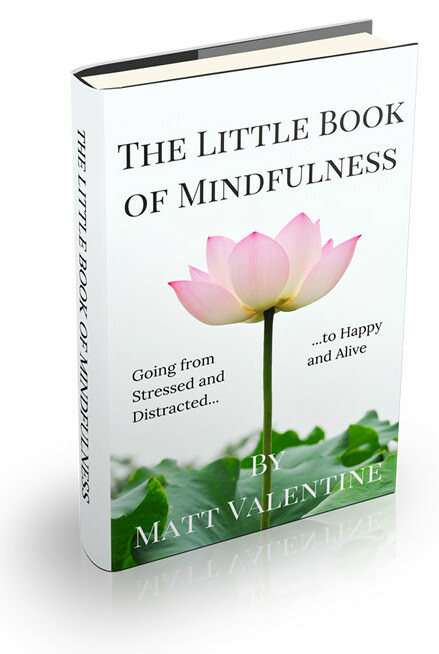 In the introduction, I covered briefly some of the reasons why you should practice mindfulness. In this chapter, I’ll expand on what I mentioned there and show you why mindfulness is the key to both finding inner peace and true happiness. All spiritual practice can be broken down into obtaining and maintaining two states: 1) a calm mind, and 2) a clear mind. In Buddhism, these two states are generally referred to by their Pali/Sanskirt terms depending on the Buddhist lineage. The first state, samatha, is a state of tranquility, inner peace, or calmness of mind. And the second, vipassana, is a state of awakening or clarity of mind. The first state, samatha, is typically translated as “stopping” (referring to the mind). Samatha is the process of stopping, calming, fully resting, and healing the mind. The growing popularity of mindfulness as a way to “manage” one’s emotions and reduce stress comes from the samatha side of the equation. Samatha, which moving forward I’ll refer to as inner peace, tranquility, or calmness of mind, is the necessary basis for the second stage, vipassana, which refers to seeing deeply or with clarity. The English equivalent of vipassana is “insight”, and it’s the word typically associated with vipassana. Insight is wisdom gained through direct experience, and insight into the “true nature of reality” is what vipassana is all about (moving forward I’ll refer to vipassana as awakening, insight, or clarity of mind). You’re likely familiar with the concept of “learning from experience”. You know, the idea that, say, reading something in a book and “knowing” it is different from experiencing it yourself. You might have read ten books on true love and think you know all about it, but until you actually experience true love for yourself you don’t really know true love. That’s insight. In the case of spiritual practice, though, this direct experience is typically a direct experience of the “Ultimate Reality”. This ultimate reality goes by many names: the ultimate or absolute dimension, the ground of being, or even God, depending on your interpretation. But we’ll get more into that in the next chapter. Likewise, the “benefits”, or purpose, of mindfulness can be separated based on these two states as well. Which brings us to the topic of this chapter: the first “power” of mindfulness. The first power of mindfulness is the ability to help one obtain inner peace or a calm mind (samatha). Inner peace is the very foundation of spiritual practice. Without it, we wouldn’t be able to obtain awakening, the state of complete liberation and true happiness. How does mindfulness help us attain inner peace? The process can be broken down into four components: stopping, calming, fully resting, and healing (the mind and body). Obtaining a tranquil mind, the practice of samatha, is ultimately about stopping. We need to learn how to stop. At first, this might seem silly, “I’m sitting while I’m reading this book. I’m stopping!” But it’s not so simple. By stopping I mean we need to stop both body and mind. A mind at rest is a peaceful mind. So we need to learn how to fully stop and let our minds calm. By doing so we bring us back to ourselves. This is called the practice of “going home”, and it’s the practice of going home to ourselves by reuniting mind and body. The practice of mindful breathing does just that- it allows us to reunite mind and body as they’re truly meant to be. This is important because the way we typically live our lives both mind and body are almost always separated. Mindfulness is in opposition to the way we usually live our lives. That is, halfway in our heads, bouncing around in an endless stream of thoughts, and halfway in the present moment, only partially awake to what we’re doing. This state of semi-consciousness, or mind dispersion, is a state where we’re unable to attain complete rest and our minds are perpetually clouded. This semi-conscious state, or mind dispersion, is what the Buddha often referred to as our “monkey mind”. Our monkey mind is constantly bouncing from one thought to another. We’re doing one thing (body) but thinking about another (mind). We’re driving home from work while we’re thinking about work, and then bills, and then dinner, and then that dinner date with your old friend coming up, and then your daughter’s school project, and then whatever happened to your favorite band because they seemed to drop off the map, and then “When was that TV special again?”, and then work, oh and then that sounds good for dinner, and then you look in your overhead mirror and think “I look tired today”, and then a Sit-And-Sleep commercial for some reason pops into your head and so you start thinking about how you really should get a new mattress soon, and then you think about home again and how the day is passing so quickly, and then, and then, and then…it never ends. That is, unless you take action. Mindfulness delicately brings the mind to rest and unites body and mind as one force. When you walk to work you’re walking to work and you’re enjoying the walk with all of your being. You’re not thinking about what’s for dinner or what you’ll say to your boss about that project when you get into the office. When you drive home you know you’re driving. You’re not letting yourself be distracted by the billboard advertisements or passing retail outlet signs. You’re truly enjoying the drive home in peace and quiet. When you’re sitting down to play with your children you’re fully present for them, giving them you complete and undivided attention. When you live with mindfulness you’re able to truly appreciate the presence of your loved ones. This state of mind dispersion does more than just make us stressed and take us away from our loved ones. On top of heightening stress and anxiety it decreases our productivity, restrains our creativity, disconnects us from the world around us, and overall makes us less happy. Instead of being at peace, our minds are in chaos. And as long as our attention is dispersed this monkey mind will rear its mischievous little head. The only way to stop our monkey mind is with mindfulness. Mindfulness gives us the ability to stop our monkey minds. Once we learn how to do this, the process of calming the mind, obtaining complete rest, and healing comes naturally. This is because, in reality, there’s no separating the four components of inner peace (samatha) as you’ll see in the next sections. By living in the present moment with mindfulness we’re able to bring our mind into a state of deep calm. A natural byproduct of learning how to stop the mind and body and simply be fully present, such as for the act of following one’s breath, is a calm mind. Indeed, the opposite of our monkey mind is a calm mind. Calming the mind is a process, though. It doesn’t happen all at once. We build up a lot of stress and tension in our everyday lives and it takes some time to fully calm the mind, especially assuming your current life doesn’t just stop when you begin practicing mindfulness (which it doesn’t!). You’ll still have the same headaches and stressors as before and so you’ll need to calm the mind despite these things constantly getting in the way. Of course, this is a two-sided problem. You might need to reevaluate why you do certain things which are causing you stress. But your focus should always be on your practice of mindfulness. By making the act of stopping a priority and seeking to live your life fully in the present moment, cherishing every moment of life, you’ll naturally begin to calm the mind. Nowadays, we’re so productivity focused we even map out our vacations. A checklist for a vacation? Yeah, we’ve lost our way. We live off of checklists and to-do lists at work and at home. We think the more things we check off of our list the better we’ll feel. We don’t even notice it but what we’re chasing is inner peace. We’re hoping for just a little slice of it here and there. Even if it’s temporary. But we don’t have to settle for these temporary states of peace. We can have the whole pie. Indeed, if we could only learn how to truly come in touch with it, we’d see that this pie is limitless. We need to learn how to attain complete rest. By complete rest, I’m referring to a fully rested mind and body. A state which most of us rarely if ever feel. And a full night’s sleep doesn’t provide this for us either. We’re tossing, turning, and bending our bodies in uncomfortable positions which lead to aches and pains. To add to that we’re dreaming constantly. And the more your mind is racing when you go to bed, the more it will be racing in your dreams when you go to sleep. Worst of all, though, our sleep can be interrupted (especially if you have kids!). That really sets us off. Then there’s the fact that sleep primarily rests the body and does very little for our monkey mind. The second we wake up, we’re right back in the jungle. Mindfulness, particularly sitting meditation, allows us to attain this state of complete rest. It gives our minds the rest it needs. My favorite example is the image of a pebble slowly falling to the ocean floor. Imagine your mind is the pebble. The longer you meditate, the deeper the pebble sinks. And the deeper the pebble sinks, the more calm and peaceful your mind becomes. Meditate until you feel your mind reach the ocean floor. Imagine your body slowly sinking just like the pebble. Then simply sit there for however long you’d like. Be fully present for this state of absolute calm. This is what inner peace feels like. This is true rest. If we can learn how to rest in this way we give ourselves the ability to overcome so much. Without a doubt, the major reason we experience so much stress and anxiety in modern life is because we don’t know how to attain complete rest. This last section is about learning how to utilize the body’s natural healing ability. In order to attain inner peace, it’s not enough to stop, calm, and completely rest the body. These are key aspects of achieving a tranquil mind. But if we don’t know how to heal our mind and body then we’ll have no chance of attaining inner peace. Our mind and body come equipped with a natural healing ability. We’ve all but forgotten about it, living in an age of advanced medicine, thousands of both over-the-counter and subscription medicines, and a whole roster of mental and physical professionals all ready to help us heal our mental and physical wounds. It’s because of this that we now grossly underestimate our own ability to heal. We’ve forgotten that the only thing necessary in order to heal is to be with that which needs to be healed. My favorite example of this is from Zen master Thich Nhat Hanh. He often speaks of how, when injured, an animal’s natural instinct is to find somewhere safe and quiet to lie and rest. This is what it means to be with an illness, whether mental or physical. By stopping all activity the animal conserves every ounce of energy. This puts all of their being into the process of healing. You can do this yourself to heal both mental and physical illness. What is a mental illness? In the case of the mind, this could be a deep-seated negative emotion or limiting belief. Maybe you hold a deep sense of resentment, and maybe even anger, towards your spouse. Years ago, when you first started dating, things were great. You were both young and you had the entire world at your fingertips. You had fun and generally lived life with wild abandon. But years later you become married, have children, and gain multiple responsibilities. Now you feel as if the entire world has closed in around you. You feel like all the opportunity and possibilities that were once at your fingertips are all but gone. Never to return. Because of this, you now resent your spouse. This is an example of a very deep-seated emotion which needs to be overcome before you can achieve inner peace. To heal this and any other form of deep-seated emotion you need to sit in meditation and simply be with the emotion. When mindful, you awaken and see through all illusions. Your limiting beliefs rise to the surface. This allows your body and mind’s natural healing process to take effect. You simply need to care for the emotion. Tend to it. Accept it fully with compassion. Much of our suffering comes from our tendency to bottle up emotions and ignore them, thinking that if we do they’ll go away. But this never happens. Neglect won’t heal your wounds. You need to face these emotions with your mindfulness and full of self-compassion. Know that you’re human and everyone has emotions such as these. Accept it fully with your mindfulness and it will subside. This is our natural healing ability and anyone can utilize this with practice. As you can see, there’s really no separating these four areas from each other. Stopping and calming essentially always happen simultaneously to some extent, resting involves stopping, calming, healing can really be considered a form of resting (or vice versa), and all four can be a part of one single mindfulness practice. Distraction is a force which takes our already dispersed attention and splits it into a million different strings. It brings our monkey mind to a whole new level. This was already touched on in the section on “Stopping”, but our modern world warrants extra focus on this particular point. If it wasn’t enough that our minds are already naturally inclined to this semi-conscious and stress inducing state, the modern era has brought us many of the worst sources of distraction all within a matter of decades. These distractions, which are the substance of our monkey mind, are always within arm’s reach in our modern world. Smartphones are in our pockets, desktops are at our place of work, and TVs are in our homes. It’s so easy to distract ourselves from reality. But if we can bring our attention back to the present moment with mindfulness we have the ability to attain both a tranquil mind and clear vision. This is the reason mindfulness is so attractive to us. Our modern world is plugged in 24/7 and it’s difficult to get away from these distractions even if you make an effort. More than ever it’s so easy to live in a mindless, disconnected, state of being. Most of us are rarely fully present. We live in a state of perpetual distraction. We live the majority of our lives in one place while thinking of another. We’re at work but we’re thinking about what to make for dinner at home. We’re at home thinking about that project we have to finish at work. We’re enjoying eating out with our family but we’re really inside of our heads, stressing about the bills we have to pay next month. We all think this is normal. That it’s OK. But it’s not. This mind dispersion is the cause of much of our suffering and discontent. After a tough day, one where you’ve been rushing around constantly and inevitably forgotten to take time for yourself. Your mind will naturally be more active. If you sit down to meditate during this time you’ll see that your mind is literally like a firecracker. It will be very difficult to keep the mind in one place for more than a few seconds. In this situation, the mind will often be distracted over nothing special. It’s still racing because it’s conditioned to you racing around, not because there’s anything particular going on in your consciousness. Mindfulness of these distractions won’t lead to any great liberation. This is simply a sign that you need to slow things down. If your life continues as is it will be very difficult to attain complete rest and fully quiet the mind. And if you can’t calm the mind you certainly won’t be able to get to the point where you can start gaining clarity of mind. Of course, that’s part of the point of mindfulness. At the beginning, in order to practice mindfulness of anything you’ll have to do it very slowly. If you’re constantly rushing around your mindfulness practice won’t be authentic. You’ll be telling yourself that you’re practicing mindfulness but you won’t actually be mindful. Computers, smartphones, and TVs aren’t the enemy. But you do need to be careful not to go overboard. For this reason (among many others), it’s important to establish mindfulness as a way of life as opposed to simply “something you do sometimes”. By making mindfulness a way of life you’ll begin to notice how these things distract you and pull you away from the real beauty of life. You’ll naturally begin to distance yourself from these devices a bit. A busy mind is only natural and the modern age has made our minds more chaotic than ever. But by developing the practice of mindfulness in your daily life you have the ability to stop, calm, fully rest, and heal the mind and body which will provide a renewable sense of peace and joy in your everyday life. In Part 3 I’ll cover all the tips and tricks I’ve personally used to establish mindfulness as a way of life.